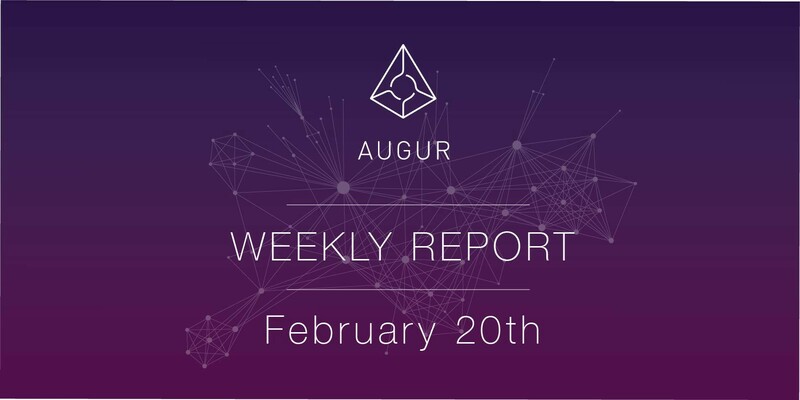 The middleware and backend teams have been continuing development on their efforts to make an in-browser state component design to replace the Augur Node server. In the last week they’ve sketched out a large amount of the overall design, including exactly how we will store and index data, and how to handle reorgs efficiently while keeping the application responsive. For reliability this comes with a whole new testing framework from the start so all new development is supported by new tests. The contracts team and game theorists are continuing the tasks laid out for Augur V2. During the last week three major code changes have been submitted and are still in first level review. These changes include exciting new features like fast resolution and the ability to update orders. Please note: Previously, the OI was recorded from Predictions.Global, which included unclaimed finalized OI in its calculation. From here on, we will be reporting pre-finalization OI and breaking down market tallies into pre-finalization, and all-time finalized categories, as calculated by CrystalBall.Be. Today, we’ve opened Guesser to those who had not signed up before. Anyone that visits the website from outside the U.S. can now invest in the outcome of real world events with 3 clicks. Guesser has also introduced their Bet of the Week feature, a unique weekly market where they will supplement liquidity, if necessary, to ensure everyone who wants to participate can do so. This week’s bet of the week: which movie will receive with the highest number of Oscars?